On June 12 Anne Frank would have turned 80 years old. She was born on June 12, 1929 in Frankfurt am Main, Germany. In 1933 her family moves to the Netherlands which is invaded seven years later by the German army in 1940. 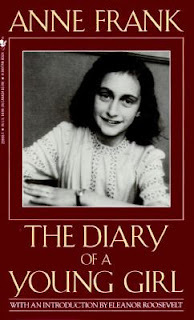 On her 13th birthday in June 1942 Anne receives a diary. The next month, in July 1942 the family goes into hiding and lives for two long years in a Secret Annex at the back of a warehouse in Amsterdam. In August 1944 the residents of the Secret Annex are betrayed and arrested. In September 1944 they are transported to Auschwitz concentration camp. In October 1944 Anne and her sister Margot are transported to the Bergen-Belsen concentration camp. In January 1945 Anne Frank's mother, Edith Frank, dies in Auschwitz-Birkenau. On January 27, Anne Frank's father, Otto Frank, is liberated from Auschwitz by the Russian army. In March 1945 Anne and Margot die within days from each other at Bergen-Belsen. A friend of the family, Miep Gies, found Anne's diary after the family's arrest. She plans to return it to Anne after the war. But in October 1945 Otto Frank receives a letter, confirming that his daughters died at Bergen-Belsen. Miep Gies gives the diary to Anne's father who decides to publish it. In the Summer of 1947 the first 1,500 copies of Anne Frank's diary are published. It is considered the best known memoir of the Holocaust. Please check out our book displays about Anne Frank and her diary.